National Center for Nuclear Research CJSC of the Ministry of Communications and High Technologies of Azerbaijan negotiates on cooperation with the INVAP SE Argentine company in the construction of nuclear reactors, the ministry stated Sept.20. The issue of cooperation has been considered in the ministry with the participation of the Minister of Communications and High Technologies of Azerbaijan Ali Abbasov and INVAP business development manager Ruben Mazi, according to the authorities. The company is engaged in the design and construction of research reactors, installations on production of radioisotopes, nuclear fuel production, uranium enrichment, the creation of tools for radiation protection, reactor protection systems, modernization and reconstruction of research reactors, as well as the provision of the specialized consulting services in the field of nuclear technology. Nobel Oil and Mineks International are partners of INVAP S.E. in Azerbaijan. Argentina also has a great interest and expresses its intention to be represented in the projects implemented in Azerbaijan in the field of satellite communication. Argentina and Azerbaijan signed an agreement on cooperation in the use of outer space for peaceful purposes in early 2014. 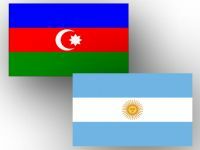 The opportunities that Argentina can offer to Azerbaijan in the space sphere and Azerbaijan's interest therein will be discussed. The signed document will be the basis for future cooperation between the two countries in this field. Earlier, Argentinian company INVAP SE offered the Azerbaijani Azercosmos company cooperation in the space area. Preliminary talks were held in early 2013. INVAP S.E. management expressed its willingness to cooperate with Azercosmos in the space sphere, the implementation of joint projects and exchange of experience and staff training in this area.